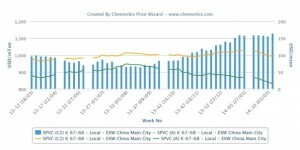 In China, domestic ethylene based PVC prices sustained their large premium over acetylene based PVC offers which encouraged more buyers to source their needs from acetylene based suppliers as per ChemOrbis. 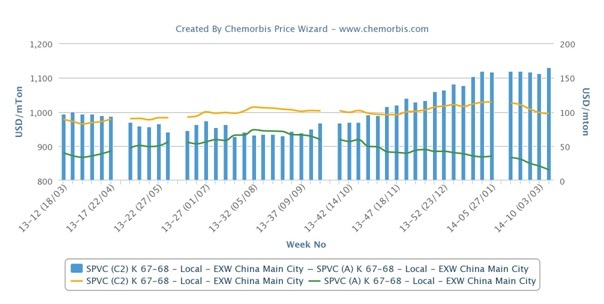 Now, domestic ethylene based PVC prices on an ex-warehouse China basis are trading at a record high premium of $165/ton over acetylene based PVC prices, according to ChemOrbis Price Index. Overall PVC demand is not encouraging amidst the widespread waiting mood on the buyers’ side ahead of new April price announcements. Inside China, PVC prices continued to edge down this week as high stock levels at local producers contributed to the stagnant atmosphere. Some companies are known to be implementing scheduled shutdowns at their PVC plants or set to reduce their operating rates in reaction to the poor operating conditions. An ethylene based PVC producer in Tianjin reported that ethylene and VCM are still expensive although VCM prices inched down recently. “We are planning to have a turnaround starting this weekend until end March due to high costs,” a producer source said. Spot ethylene costs gained around $35/ton from a month ago on CFR North East Asia basis, while softening $10/ton on the week. A second producer maintained their domestic PVC offers stable from last week while facing sales pressure due to weak demand. “We heard that some converters are using more acetylene based PVC instead of ethylene based PVC these days. Our poor sales performance forced us to shut some of our lines in order to reduce supplies,” a producer source stated. “We had to reduce our PVC operating rates to 50% last week considering our losses. We could sell only a small amount of material,” another producer reported. A trader based in Hangzhou commented that domestic PVC prices have lost around CNY300-400/ton ($49-65/ton) since the end of Chinese New Year Holiday. “Many of our customers who use ethylene based PVC switched to acetylene based PVC to save on costs. They are buying on their needs basis in very small quantities,” he said. Buyers will start to purchase actively if prices show some rebound, he thinks, but he is not optimistic about the market outlook. “Acetylene and ethylene based PVC prices continued to fall this week. We refrain from sourcing material over the near term as prices are still under downwards pressure. We mainly offer acetylene based PVC now given its competitive prices, while demand remains slow even after our price cuts,” a different trader noted. “Weak local prices and slow demand may sustain their downwards pressure on import prices in the days ahead. Suppliers can hardly lift their prices due to slow demand and soft domestic markets. We heard that some local producers elected to reduce their capacity to protect their margins, which can hopefully provide some gradual support to the market,” another one commented. An acetylene based PVC producer also lowered their operating rates to reduce supplies given high stocks and slow sales. The producer feels prices have some more room to decline. A second acetylene based producer cut their prices by CNY50/ton ($8/ton) to speed up their sales, while lamenting that they could still sell only small quantities amidst persistently slow buying interest. “Most ethylene based PVC makers will reduce their operations by at least 50% or shut their plants for turnarounds given high costs and sluggish demand. Acetylene based materials are still more competitive as costs for this grade are not that high and we still manage to make some profits. No shutdowns are on the horizon,” a trader offering acetylene based PVC mentioned. He hopes that overall demand will improve by April, in the meantime. When it comes to buyers, a profile converter reported receiving lower acetylene and ethylene based offers. “We are unwilling to build high stocks as we expect to see lower prices in the days ahead. Although end demand has improved from last month, it remains unsatisfactory,” he added. According to ChemOrbis, in plant news, Taizhou Liancheng Plastics Industry cut run rates to 50% at their 450,000 tons/year PVC plant in China. Tianjin LG Chemical planned a maintenance shutdown at their 800,000 tons/year PVC plant. The shutdown was to start in the second half of March to last 20 days. Suzhou Huasu shut their 130,000 tons/year PVC plant citing poor margins in early March. Siping Haohua reduced run rates to 60-70% at their 250,000 tons/year plant given high costs, low PVC prices and weak demand.